It’s been said that before you know where you’re going, you have to know where you’ve been. These vintage advertisements for home television and radio products may seem funny and dated now, but at the time they represented high technology. 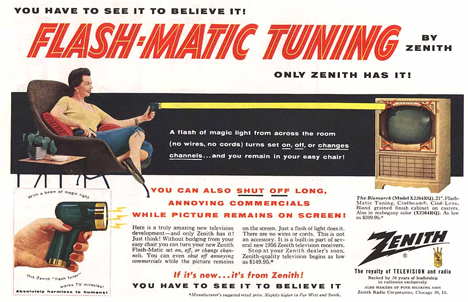 The above 1950s ad for Zenith Flash-Matic Tuning promises that “a beam of magic light” will let you turn your TV on or off or even change the channel – all from your easy chair. The device looks more like a gun than the button-laden monster remotes we use today. This “luxurious console” from Admiral included some pretty state-of-the art technology for its time. The centerpiece of the entertainment center was its “big” 10-inch television screen. 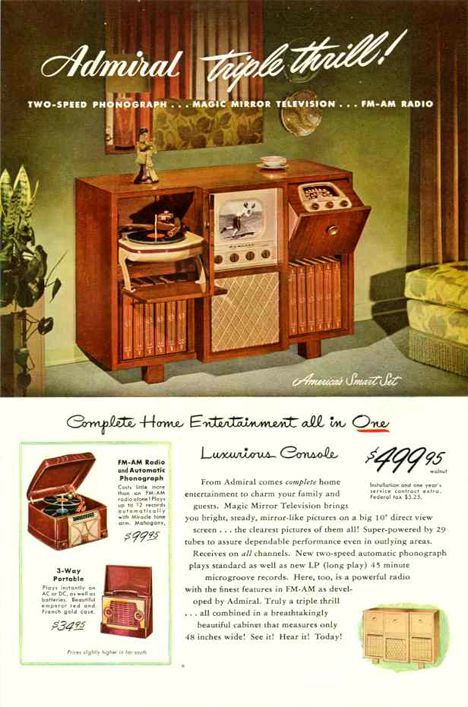 The two-speed automatic phonograph and AM/FM radio filled out the handsome 48-inch wide console. 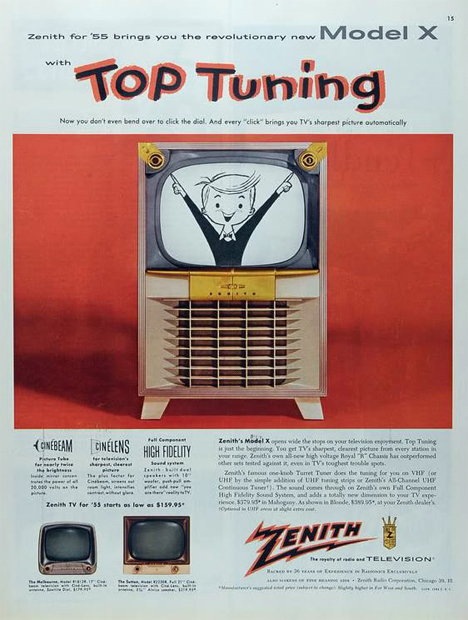 This 1955 ad for a Zenith Model X television reminds us just how far television and entertainment technology has come. In 50 years we’ve gone from these thick, clunky machines with small screens and twisty knobs to 50″ plasma screens with hundreds of channels and the ability to pause our favorite shows at will. 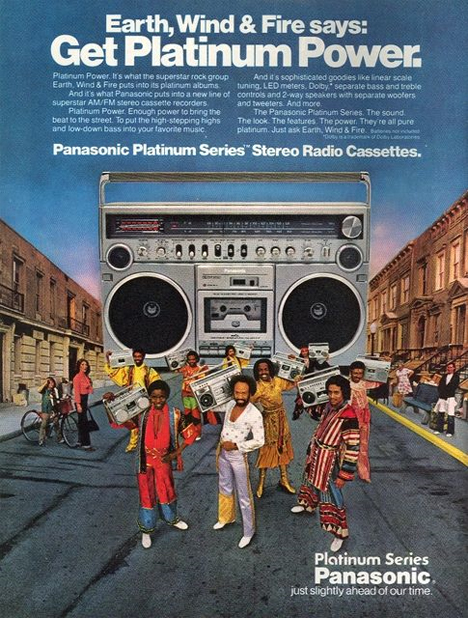 Well, if Earth Wind and Fire recommend this massive boom box, it must be good! The AM/FM tuner and cassette deck were pretty great for their time, but unfortunately the bell bottoms weren’t included. 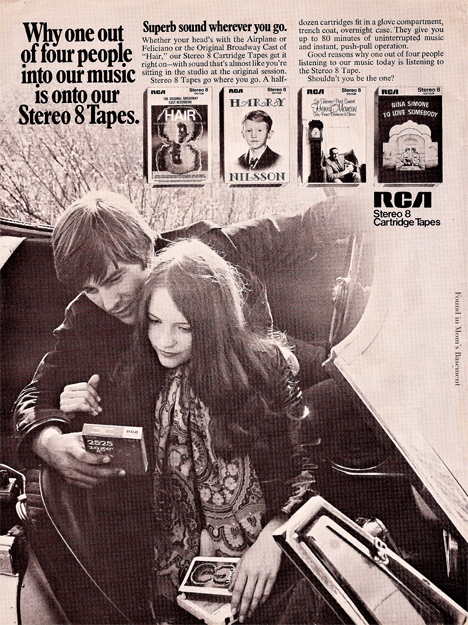 Today we carry our music on tiny pocket computers, but in the 1960s, 8-track tapes were state of the art. The technological advances required to make 8-tracks possible were pretty extensive and made possible, to a large extent, by the automotive industry. Ford and Chrysler were big supporters of the portable recorded music revolution. 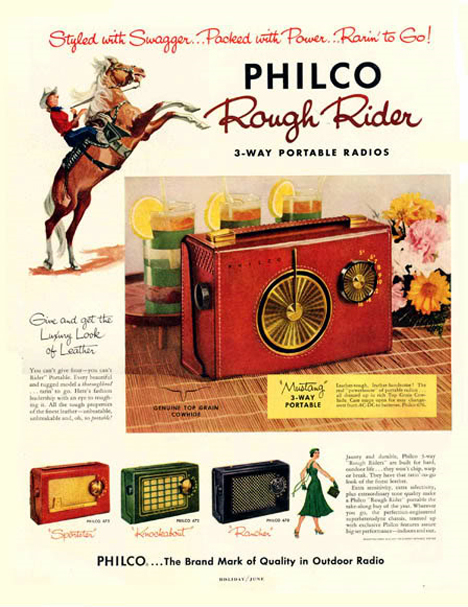 Radios are such a ubiquitous thing today that it’s odd to see a modern radio ad. But in 1956, radios were the centerpiece of many homes’ entertainment. This portable radio let the 1950s family take their favorite radio shows with them when they went out. See more in Aged Adverts or under Vintage & Retro. September, 2009.